If the IVE are so bad, why don't more ex-members speak out? Occasionally the question comes up: If the IVE & SSVM are so bad, why don't more speak out? In this post we'd like to address the people who ask this question. First off, many do speak out. There were many critics of the IVE in Argentina, especially among conservative Catholics, that frequently spoke out about the group over the last 25 years. They've since tired of the subject, but you can still find occasional comments on the site here or posts like this one from those that raised the original objections to Fr. Buela and his behavior. And of course, there is Jack Tollers who also contributed to this site here. And Professor Silletta here. There are also a number of ex-members we've found who have now or in the past blogged about the IVE (here, here, here, here, and here), more who have commented under the various posts, and even a Facebook page from Argentina if that's your thing. If you want to know why we decided to speak out, you can read about that here. So clearly many do and have spoken out. Why don't even more speak out if it's so bad? Well, there are various reasons, both personal and practical, why people would not go public, even anonymously, after leaving: Some can't risk upsetting Church authorities, others aren't in a position to speak out effectively, some might be discouraged by personal attacks from IVE supporters, many are spiritually wounded and want to move on, and a large number don't want to further damage family relationships. Let's look into these five reasons below. Many men who leave the IVE still need the IVE as a reference and don't want to risk upsetting them further. This is the case with men who leave the IVE during formation and are still considering a vocation to the priesthood. By Canon Law a seminary accepting one who was previously a seminarian elsewhere needs to get feedback from that earlier seminary. So, if you join the IVE seminary and leave with the intention of entering somewhere else, speaking out could ruin your chances of still becoming a priest. In these situations, which is the most prudent course of action? Writing a scathing letter about your former congregation to your Bishop with no idea how he'll react? Talking about your experience on the web and risking the ire of the IVE (who could probably guess your identity regardless if you are anonymous)? Or just being quiet and worrying about your own vocation? You can see how staying quiet in these situations is often the most practical decision. After all, the IVE can be quite vindictive. Buela's "Reminiscencias" is an example of this, but you can also see it in the way they treated Fr. Mikalonis after leaving. They had no qualms stonewalling the Bishop in Ireland who was trying to figure out what happened, but they went out of their way to notify American Bishops to be on the lookout and not to accept Fr. Mikalonis. Even if you aren't concerned about upsetting the IVE, speaking out still isn't that simple. Prior to this site and SSVM Abuse, if you were an English speaker you would find nothing on the subject on the internet and getting in touch with ex-members would be difficult to impossible. Left alone with their thoughts, it wouldn't be easy for one to clearly identify and articulate the problems within the Institute. Even if they could, writing and maintaining a site like ours can takes a lot of time from multiple people, it takes some internet savvy, it takes some theological background, and it takes a fair degree of confidence. Even then, someone who had all these things is still going to be advised to just to stay quiet, shake the dust from his sandals, and focus on their own spiritual life. If you still choose to speak out you are likely to be subjected to all sorts of vitriol by IVE supporters. You only need to review the comments on the blogs or facebook page we mentioned for examples of this. IVE supporters and even IVE priests will attack you. They'll accuse you of breaking vows, of committing sins like defamation or detraction (BTW - speaking out about a public order and public founder is neither of these.) They'll accuse you of blasphemy. They'll call you bitter, angry, or any number of adjectives. Even this website has received threatening letters from people who are obviously close to the IVE. In the face of all this, it's not surprising that a sound and confident person would just choose to remain quiet after leaving. However, most that leave the IVE are neither sound, nor confident. The IVE formation can be very brutal and manipulative. Many leave very, very wounded - especially the women. These are stories we'd like to tell, but can't simply because the stories don't belong to us. They belong to individuals who don't have the strength to speak out and have not given us permission to publish their stories. Others write in to thank us for this blog, but quickly cut-off contact. They mention how it's "been a long road out of the IVE" or they are "still struggling to build a relationship with God" after He allowed them to be led to such a dysfunctional, harmful group. Then there are the stories we receive about ex-members being "persecuted", filling up the offices of Mendoza therapists and psychiatrists with depression and suicidal tendencies. So to answer the question, many ex-members do speak out publicly. Many more speak out to us privately. As for the rest that remain silent, as you can see above, they have many legitimate reasons for doing so. This is the first part of a two post series. For part two go here. Although strangely reticent about the many who leave during formation and after ordination, the IVE still love to talk about numbers. When you hear someone from the IVE talk about "bearing fruits", the fruits are invariably measured quantitatively by headcount: "This number of priests. That number of people in formation. This many novices." Ask a priest how his parish is doing he'll tell you how many kids are in catechism and how many attended such and such retreat. These numbers not only matter to the IVE, but to prospective members as well. After all, there is often "safety in numbers." Numbers provide reassurance: "Hey… They all joined... so it can't be that bad." People are thus reassured by the many pictures of large groups on IVE websites, their Facebook page, their Twitter, Google+, Flickr, Tumblr, etc. The IVE know image matters. The constant presence of a photographer at IVE events is not an accident. As we've mentioned before, once you scratch the surface and get beyond first impressions, the IVE are not all they seem to be. Be it their history, formation, or poverty, there is always more to the story than what their leadership presents to the public. That holds true in this case as well. Once you lift the veil and understand what's behind these numbers, who has joined and why, the truth is much less reassuring. Let's take a look at each of these groups. Illegal Aliens - The American Church does not accept illegal aliens into its seminaries and neither do any orders who form candidates in America. They all ask that men return to their country of legal residence to pursue a vocation, whether that means studying there or returning to the US to study with the proper visa. There are some obvious reasons for this. The first is that it's a violation of federal law to knowingly harbor individuals who are in violation of immigration law. The second is that individuals who are entirely dependent on an order/diocese with no legal status are not entirely free to choose their vocation. Too old for religious orders - There are some men who choose the IVE because they feel called to be part of a order religious order as opposed to the diocesan priesthood, but are in their late 30's or 40's, which is usually over the age cut-off for these types of groups. If this describes you, we'd really encourage you to cast a wide-net and reach out to as many orders as you can. See here. You have many more options than you think you do. Even orders with stated age-limits make exceptions. If age is really the limiting issue with orders, then consider reaching out to some conservative bishops. If, after all this, the IVE is still the only group that will take you, it's probably not a good sign. Too old even for dioceses - This group is primarily comprised of widowers, however there are some with annulled marriages as well. These are men in their 50's and 60's who are over the age cutoff even for dioceses. Most of the men in this group leave very quickly and very disappointed as they learn first hand the issues we outline on this blog. There are a few that stay, however - men who generally have had very 'interesting' pasts and would likely not have been accepted into any diocese or order regardless of their age. For all the IVE's talk about the need for "well-formed priests", they have taken great liberties with these men, pushing them through to ordination very quickly and with very little actual formation. Men kicked out of other seminaries - These are men who have been kicked out of other seminaries. They've been 'asked to leave' in such a way that their formation should have effectively been over and no other seminary/diocese/order in the USA would accept them - except, of course, the IVE. No positive qualities: Most men aren't going to the IVE because of any unique charisms or qualities the IVE possesses. They are going there because it is the only place that will take them. To put it another way, the IVE grows only because it has lower standards than anyone else. Pride, hubris, and arrogance: It is through arrogance and hubris that the IVE ignore the Church, Canon Law, Immigration law and the opinion of every other Catholic seminary in the United States by accepting candidates no one else will take. It is pride and overconfidence which makes them think they are better judges of prudence and character and can properly form these men where other seminaries can't. The IVE are not concerned about their parishioners: There is a reason that these men can't get into any other seminary. Many have mental illnesses, major personality disorders, histories of strange and imprudent actions, immaturity issues, etc. Ordaining them and sending them to a Catholic parish could endanger good parishioners that are under their spiritual care. Priests are viewed as authority figures, especially in the moral and spiritual realm. Nothing has done more damage to the Church and the faithful in recent years than poorly screened priests. Yet poorly screening priests is exactly what the IVE does. The IVE are not concerned about their candidates: If someone needs to be baptized or confirmed during the novitiate, they likely have not properly discerned their vocation to religious life and are not in any way spiritually ready for religious life. It's even against canon law (see C. 645) to accept them into a novitiate; Letting the spiritually immature enter into a very extreme environment will not be healthy for them either. Many if not all who enter prematurely like this leave wounded. Neither is encouraging illegal aliens to remain here illegally is not in their best interest. None of these "exceptions" show compassion or charity toward the candidates. If someone does not have all their sacraments of initiation, the right thing to do is to give them the sacraments at their parish and then give them time and help to develop a mature spiritual life so they can discern their vocation properly. If someone is here illegally, neither is it charitable to violate Church practice and Federal law by accepting them to the novitiate. It places these men in a very vulnerable and difficult position. If they genuinely feel they have a vocation, they should go to their home country and the Institute should help them get the appropriate visa. It's not that difficult and they've done it for other candidates in the past. If someone has mental, emotional, or personality issues that would preclude them from entering a seminary or lead to their expulsion from one, the right thing to do is to help them address these issues before they even tackle the question of a vocation. The Church has reasons that men like this cannot be accepted into US seminaries, yet the IVE does so anyway and (thanks to Cardinal McCarrick's complicity) ordains men from all of the above categories. So the next time you are encouraged by a large group photo of the IVE, keep in mind why many are there: manipulative recruiting methods and dangerously low standards. Once you pull back the curtains a bit, these photos - like so many other aspects of the IVE - are much less encouraging. The preaching of the spiritual exercises of St Ignatius have long been a staple of the IVE under Fr. Buela. While the exercises in and of themselves are certainly a great spiritual gift, we have been concerned for some time that their traditional purpose as an opportunity for discernment was being deformed by the IVE practitioners. He who is giving the Exercises ought not to influence him who is receiving them more to poverty or to a promise, than to their opposites, nor more to one state or way of life than to another. Unfortunately, many IVE priests do influence those attending, especially during one on one direction or confession. This was the experience of our friend Laura Monica. It was also the experience of another reader who remarked that during the exercises "it was funny how the only answer seemed to be 'join the order'." These stories have us concerned that the IVE have warped the spiritual exercises into a tool for recruiting vocations. "With timing, with the emphasis, and with many other subtle methods, the IVE way of conducting the Spiritual Exercises does not conform with Ignatius’ view of the role of the person giving the exercises... the retreat becomes about the teachings of the particular priest rather than allowing the individual to hear whatever it is that God wants to communicate at that time… When individuals viscerally experience their intense brokenness and sinfulness without also simultaneously experiencing God’s love for them… they enter an extremely vulnerable and frightening place… In this tumult, entering the IVE/SSVM can seem like the obvious solution. They are able to run from their selves and their pain and towards the certainty that a life with the IVE/SSVM would seem to provide. This is simply not the freedom to serve God with generosity that Ignatius sought to let others experience. It is positively dangerous especially because individuals who chose to take the risk to go on retreats are often already in a vulnerable place…"
Before going forward, we want to repeat here as we have done many times before that there are many very, very good men among the IVE priests. (The writer strongly agrees with this and is grateful for the hospitality and kindness received.) They were raised in this method of the exercises and of discernment. The individual priests are not to be faulted for any issues outlined below. They are made to preach the exercises regardless of their level of training, time for preparation, or conflict with additional responsibilities. Many are equally uncomfortable with it - albeit for different reasons. What follows is Ines' heartfelt letter reproduced in its entirety. While each retreat is unique and even individual experiences within the same retreat may vary, anyone who considers attending these exercises should be be attentive. Be sure to read all the way to the end where discernment is dealt with in even more detail. Today, with a Jesuit Pope, there is an increasing interest in Ignatian Spirituality, and, particularly, The Spiritual Exercises. Ignatius of Loyola intended for them to be accessible to all—not just the province of the Jesuits. This spirituality, almost 500 years on, continues to profoundly impact men and women throughout the world, bringing them into a deeper relationship with God. I am very familiar with Ignatian Spirituality through participation in several forms of retreats in both English and Spanish—including weekend retreats, 8-day retreats, and the 19th Annotation Spiritual Exercises in Daily Life. I have also done significant study of the Exercises from a more academic perspective, and helped to lead retreats myself. Recently, I was looking for a weekend Spiritual Exercises retreat and happened upon one lead by the IVE/SSVM. The IVE/SSVM claim to model much of their spirituality on the Spiritual Exercises. They frequently offer weekend Spiritual Exercises retreats for laypeople and for people who may be in the first steps of discerning a vocation. However, this retreat had very little to do with the spirituality of St. Ignatius, but it badly distorted it. This version of the Exercises should be avoided. 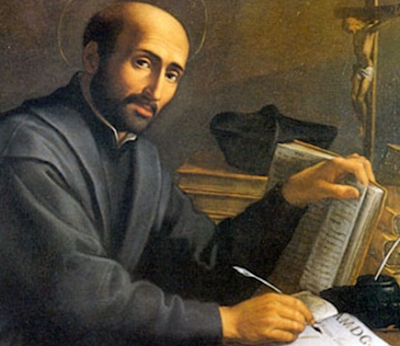 Far from just being a variant on the Exercises, it presents a spirituality that is self-centered, closed off from the world, and consistently misrepresents St. Ignatius. Man is created to praise, reverence, and serve God our Lord, and by this means to save his soul. And the other things on the face of the earth are created for man and that they may help him in prosecuting the end for which he is created. From this it follows that man is to use them as much as they help him on to his end, and ought to rid himself of them so far as they hinder him as to it. For this it is necessary to make ourselves indifferent to all created things in all that is allowed to the choice of our free will and is not prohibited to it; so that, on our part, we want not health rather than sickness, riches rather than poverty, honor rather than dishonor, long rather than short life, and so in all the rest; desiring and choosing only what is most conducive for us to the end for which we are created. From the initial purgative aspects—of the consideration of how sin works in us—the Spiritual Exercises go on to allow us to develop our relationship with God, approaching an understanding of the complex mysteries of the incarnation, resurrection, and redemption, and experiencing with our senses and imagination the earthly ministry of Jesus from his birth to his crucifixion, and further, witnessing his resurrection, all the while engaging in prayerful conversation (colloquies) with Jesus, Mary, and God the Father. We don’t get stuck in our degradation and shame and guilt. We recognize that the last word really is the resurrection. But in the IVE/SSVM weekend version of the “Exercises”—the focus remained nearly entirely on MY degradation, MY shame, and MY guilt. This is problematic for a number of reasons, but a few reasons in particular stand out. First, Christian spirituality should be about decentering us. It should not be about my goodness or my badness, but about God’s goodness. By having us focus so intensely on our own individual sin, we remained self-centered. The first sin, pride (superbia in Latin or soberbia in Latin) is about being self-centered, autonomous, keeping our eyes fixed on ourselves and not God and others. Second, the IVE priests try to motivate people by fear to avoid eternal damnation. However, Ignatius thinks that people who are motivated by this are not ready for the Exercises. The Exercises are for those who are seeking to continually live their lives ad majorem Dei glorium [to the greater glory of God]. Ignatius talks about some people “who are going from mortal sin to mortal sin.” . These aren’t the people who are ready to undertake the Exercises. At one point, the priest even said, “If you do not follow the Principle and Foundation, your soul is at risk of eternal damnation!” This is the extreme antithesis of the Principle and Foundation, which has nothing to do with fear and coercion and is entirely about generous response to grace. Rather than just being a poorly done retreat, or a retreat where the text of Ignatius is just read, and then individuals are left to experience the weekend with very little guidance, a specific ideology of a judgmental and punitive God removed from everyday human life was consistently developed. The reduction of the Exercises into a weekend retreat is always difficult, in even the best circumstances. However, the focus was disproportionately on sin/damnation. There were no meditations or contemplations on the positive things of creation or a single contemplation of Jesus’ life and ministry and Passion. In Ignatian Spirituality, contemplation generally refers to putting oneself into the scene. Through the application of the senses—sight, sound, taste, smell, and touch—the person making the Exercises finds oneself experiencing the events of the Gospels with the heart. However, outside of a cursory 5-minute lecture on what this might look like in the situation of the Nativity [121-126], this method of prayer was essentially ignored. In the actual Spiritual Exercises, a great deal of time is spent on this style of contemplation. The idea is that in the so-called Second Week you get to really know Jesus by accompanying him through his 33 years of life so that you are able to be present to him, to the best of your abilities, during the Passion, the Third Week. This isn’t the suffering of a stranger you are hearing about, but you are actually witnessing the suffering of a beloved leader and friend. After the desperation of the Third Week, in the Fourth Week, you are given the opportunity now to become a witness to the Resurrection through Jesus’ post-paschal appearances. While, in the closing Mass, there was a passing reference made to the Contemplation to Attain Divine Love and to the Resurrection, this was rushed and did not bring focus on how God was still active in the world. The way in which this type of prayer was nearly absent deprived retreatants of much of the heart of the Spiritual Exercises. As he who is receiving the Exercises is to give an hour to each of the five Exercises or Contemplations which will be made every day, he who is giving the Exercises has to warn him carefully to always see that his soul remains content in the consciousness of having been a full hour in the Exercise, and rather more than less. For the enemy is not a little used to try and make one cut short the hour of such contemplation, meditation or prayer. I thought that this might be just to do with the concentrated weekend experience, but, in the online program that the IVE runs, www.ejerciciosive.org, only 27 minutes are suggested for each exercise. With timing, with the emphasis, and with many other subtle methods, the IVE way of conducting the Spiritual Exercises does not conform with Ignatius’ view of the role of the person giving the exercises. The point of the Spiritual Exercises are to get a person into a position in which all sorts of desolations and consolations are working actively, stirring him or her up, and giving him/her the chance to work directly with God to become more directed to God’s will. It is the time, more than almost any time, when outside influence or pressure should be avoided. However, the way that the IVE priests are trained to lead the retreat ends up doing the opposite. By reducing the time that individuals have to actually become acquainted with God, and focusing on intellectual meditations on judgment, the retreat becomes about the teachings of the particular priest rather than allowing the individual to hear whatever it is that God wants to communicate at that time. They take a very powerful experience, but do not give men and women the freedom and space they need to figure out how God is calling them in the silence of their hearts. Rather, when individuals viscerally experience their intense brokenness and sinfulness without also simultaneously experiencing God’s love for them—particularly developed in the contemplations of the 2nd and 4th weeks—they enter an extremely vulnerable and frightening place. They are anxious to find a way out of this guilt and shame. In this tumult, entering the IVE/SSVM can seem like the obvious solution. They are able to run from their selves and their pain and towards the certainty that a life with the IVE/SSVM would seem to provide. This is simply not the freedom to serve God with generosity that Ignatius sought to let others experience. It is positively dangerous especially because individuals who chose to take the risk to go on retreats are often already in a vulnerable place: I found myself at the retreat because I was seeking solace in the context of being a caretaker for an ill family member; others may be seeking to heal from trauma or addiction; and others may be struggling with what it might mean to enter religious life. Does not move me to love you. To leave all that offends you. Mocked, nailed to that cross. It moves me to see your body so wounded. Your dishonour moves me, and your death. And —even if there were no hell— I would fear you. In the same way I love you, I would love you still. I am saddened by the experience I had, particularly because the members of the community were exceptionally kind and hospitable, and so I want to be clear that this is not a judgment of them. Their good will was abundantly evident, and I hope that they can find a healthy and life-giving way to live out what I believe is a sincere commitment to serving God and the world. Anyone who is curious about the Spiritual Exercises should very much be encouraged to learn more and undertake them because they are not just something that belongs to the Jesuits, but to the entire Church. However, the IVE simply presents them in a spiritually dangerous manner. Despite the usual, follow-up comments calling into question Mr Garcia's identity and virtue (which seem to be par for the course with IVE apologists), he was eventually proven to be absolutely, 100% correct for less than five years later the bishop had to ask the IVE to leave the parish and diocese. It's also a good reminder that, while you can ignore the messages on this blog, you'll eventually learn we are telling you the truth - even if it takes five years like it did in Ireland. Our simple message is this: we've given you the tools to verify everything we have told you on this site. If you choose to ignore these warnings, you do so at your own risk. Unlike those who came before you and who did not have access to this information, you won't have ignorance as an excuse. Oh, and Christophe, if you are out there, drop up us a mail. This is part two of a four part series. Part 1 is here. Parts three and four will follow in the coming months. We have warned you that it is probably not a good idea to enter the IVE - at least not until its institutional problems are resolved - assuming they can be. At the center of these problems is the process of formation cultivated by Fr Buela and now institutionalized into the IVE culture and all its houses of formation. It's from this dysfunction in formation that we see the two main fruits of the IVE - the recruitment without proper discernment or concern for the candidate and the diaspora of young IVE priests leaving soon after ordination. This is the second in a series of posts where we'll highlight the many issues you'll encounter during formation with the IVE (issues, that of course, the IVE doesn't tell you about.) We are focusing one post each on the 4 pillars of formation laid out by John Paul II in his exhortation Pastores Dabo Vobis: the Intellectual, Spiritual, Pastoral, and Human pillars of formation. Self-sacrifice? Yes, in more ways than you probably can imagine. Intense prayer life? Well, as we covered in part I of this series - and in many other posts on this site - the IVE like to say one thing and do another. Whether this is purposeful or out of ignorance is not our place to say, but it is our place to make you aware of it so you can make an informed decision and give informed consent when entering the IVE and submitting to its superiors. There are several problems in this area. The first and most apparent is that this is a religious community without any true charism. If one looks at the Orders who have stood the test of time, the Jesuits, Dominicans, Franciscans, Carmelites, Salesians etc., they all had a charism given to them by God. They each had a clear mission. Jesuits are to be educators. Dominicans are to be Preachers. Franciscans are to preach the cross of Christ through poverty, penance, and preaching. Carmelites are to live lives of penance and be contemplatives. Salesians evangelize the poor and abandoned - especially the youth. The success of all of these religious orders, and the struggles and failures many have had as of late, are relative to how faithful they are to their charism. When an order strays from the mission it was given by God, one shouldn't be surprised when problems begin to arise. This is why these Orders were strongest while their founders were still alive or after a reformer came along. The founder would have kept them true to their mission and the reformer working to return them to it. One has only to look at the history of Religious Orders to see the importance of a charism and the necessity of sticking to it. In practice, the IVE does not have a defined charism. They do not have a particular mission. They did not start with a charism. Their current "Evangelization of the Culture" is so broad it's effectively meaningless in word and deed. If they are asked what their charism is they'll give various answers ranging from, “We are orthodox and joyful,” to “We are about the New Evangelization,” or “We embrace love of the Cross.” None of these are true charisms. They are only broad generalizations without any true path for accomplishment. "Orthodox and Joyful" is not distinct to a group. The New Evangelization - what does that mean to them? Everyone claims to be about the new evangelization. Love of the Cross - that is not particular to them either. Because they have no charism they have no guiding principle or direction. They simply take what they like from many other Saints and Orders. This can be a good idea when done prudently and it is what diocesan priests do. Unfortunately, the IVE do not do this prudently. Their founder pieced together many disparate, often conflicting practices with no framework to make sense of them and no way to integrate them. Some practices do not work with others and certain practices isolated from their original structure are not efficacious. Practices of certain saints and religious orders often work very well in their system, but if removed from that environment and placed in another - in combination with things they were not intended for - they are ineffective at best and potentially harmful. To use an example from nature, a shark is the one of the top predators in the ocean. It moves quickly and has little to fear. Yet if you put that same shark in a lake or on land it will die. Not all things can be isolated from their intended environments without problems. For example, in the IVE, during their Spiritual Exercises, which they consider a staple of their spiritual formation and discernment, they have people following Ignatian Rules while simultaneously reading St. John of the Cross. Each of these is great on its own but they are not intended to be mixed. They teach contrary approaches to prayer. The exercises are based on imaginative prayer, using your sensory imagination, while St. John of the Cross states one should never do this. They both have spiritualities that work but they are based on different forms of prayer. Using one form of prayer with another spirituality will not allow one to accomplish what the saint originally intended. The Institute is trying to build a spirituality by isolating practices and combining them with others they weren't intended for and do not work with. Imagine if someone tried to build a car using an engine from a jet ski, a tractor tire, a tire from a bicycle and the steering mechanism from an airplane. All of these things are good if used in the way there were intended in the environment intended. Yet trying to use each of them without their supporting structures - and then combining them with equally isolated practices - leads to disaster. In some cases this mish-mash appears the result of innocent, if misplaced zeal - yet in other cases the Institute seems to have searched quite extensively, often relying on obscure texts from (sometimes very obscure) religious figures to justify some of their practices. Take their approach to obedience, for example. Like the Legion of Christ before them, the IVE claim that their religious vow of obedience is modeled after obedience as St Ignatius prescribed it for the Jesuits - especially their "obedience of judgment", also referred to as "obedience of the intellect." They would tell you as much if the subject was brought up in conversation. Yet they don't quote St Ignatius in the relevant section of their constitution at all - probably because he would not support their view. Instead they string together various quotes with zero context. Quotes from religious figures - sometimes very obscure religious figures - all from different orders, with different charisms, thus with different intentions in their words. Then from this they preach and practice what is essentially a blind obedience to superiors - much like the Legion of Christ did. This is but one example. There are many others. We cannot know their motives for creating such a chaotic, disorganized spirituality, but we can think of a few explanations that make sense. Either it is born out of ignorance and misplaced zeal or it comes from attempting to justify pre-determined courses of action - though we imagine it could also be a combination of the two. They tell young people: “Do this, do that.” So a seventeen- or eighteen-year-old boy or girl gets excited and they push them forward with rigid directives [...] This type of rigid religiosity is disguised with doctrines that claim to give justifications, but in reality deprive people of their freedom and do not allow them to grow as persons. There are other practical problems with their spiritual formation. One is that they do not teach correct priestly spirituality. For instance, there is a clericalism there which, prior to our experience with them, we could not have believed. They act and demand that they are to be served rather than to serve. They quite literally treat men in formation and all the sisters as servants, waiters, gophers, personal drivers, etc. - to the extent that even special food and drink is reserved exclusively for the priests at every meal. Division of labor and fostering a spirit of humility and service is one thing - instead they foster the idea that with ordination comes graduation into a realm of entitlement. They hypocritically, yet openly flaunt their vow of poverty which states they should "choose the worst." Rather than provide an example to those in their care, the IVE priests lord it over those in formation. This is a huge problem. From the clericalism it's a logical extension to their blurring and disappearing of the line between internal & external forum - so much so that - even though it's a basic tenant of formation and is covered by canon law - the concept of "internal & external forum" is never even discussed by the IVE with those in formation. You'll only learn about it if you have experience with another order or seminary. We've written in detail on how the IVE disregard internal/external forum and the relevant sections of canon law under "Sign #13" here. St. Francis de Sales says on the subject of a director: "He must be a man of charity, learning, and prudence; if any one of these three qualities be wanting in him, there is danger." St. Teresa expresses the same opinion. The clericalism, the lack of concern for candidates, and your own eventual experience will make it clear the IVE is institutionally deficient in charity and prudence. We've also clearly outlined in the first part of this series how anyone formed by the IVE will be deficient in learning. Spiritual direction from an IVE priest - as we could personally testify - is dangerous. Further, while St Francis de Sales could only imagine one out of ten thousand as a capable spiritual director, nearly every IVE priest is saddled by his superiors with this grave responsibility. The number of older, learned, and qualified spiritual directors in the area is quite plentiful given the many orders and seminaries in the DC / Catholic University area. Yet you won't have the option of choosing one of these experienced directors. IVE seminarians are stuck choosing from the few local IVE priests, many who are less than a few years removed from ordination and - lacking in all three key characteristics outlined as necessary by Garrigou-Lagrange, St Francis de Sales and St Teresa of Avila above - this is dangerous. To make matters worse, your IVE director will likely only be interested in you in so far as your vocation to the Institute. Even if you leave on good terms (which is not always easy to do) and want to continue with your spiritual direction you'll find your spiritual director will quickly be too busy for you - cutting you off from spiritual direction in a time of great spiritual need. Like their "spirituality" and "charism", even prayer follows a check the box off approach at the institute. On an individual level, there is very little time available for personal prayer because of the crowded, arbitrary schedule. In fact, even the most liberal seminaries give more time for quiet, personal prayer than one will receive with the IVE. For about 45 minutes of the adoration there will be silence and usually that's the only silence you'll get all day. In the US seminary your Holy Hour is crammed between the excessive business of the day on one side and the noisiness of the dinner table on the other. This is contrary to the instruction of the Spiritual Doctors of the Church. St Francis de Sales explicitly cautions about going from Holy Hour to a lot of noise - yet the IVE brag about this very practice on their website. For many, the time in adoration is little more than a chance to catch up on sleep or to cry in silence (crying will be a daily occurrence among the sisters and quite frequent among the men as well - tears of joy or contrition we are sure.) Only one priest will show up for adoration at the seminary. All of the others are off relaxing or doing work. The Novice master and parish priests where the novitiate adoration is held almost never show up either. The same could be said for evening and night prayer. When in conflict, work takes priority over one's spiritual life. Your prayer life can therefore be severely restricted based on your "office" or work responsibilities. If you are on cooking or service duty this greatly affects your prayer life on that day. If you are cooking you have to leave Mass right after receiving Holy Communion to go and get everyone's breakfast ready and in the evening, while everyone else is in adoration, you are stuck in the kitchen preparing dinner. (To make it worse, you have to prepare two meals, one for priests and another for seminarians.) In theory you could get one hour before the Blessed Sacrament at some other time during the day, but in practice this is very difficult to manage due to the overloaded schedule, the lack of personal freedom, and the general disorganization (one could say an almost institutional distaste for applying organization or prudence to any undertaking.) And there are many offices worse than being a cook. Regardless of your individual responsibilities, you'll still find yourself working quite often on Sundays and Holy Days - we are not talking about pastoral work, but unnecessary manual labor which could be done any other day. This is a direct violation of the 3rd Commandment. If that seems harsh, imagine washing floors or scrubbing toilets on Christmas or Easter Sunday - your superiors telling you it's not really work if you remain joyful while doing it. They do this because they want to keep those in formation busy at all times - can't give you too much time to think, after all - even going so far as to order their seminarians to violate God's law. This sense of busy-ness and activism is harmful to the spiritual life and is warned against by all Spiritual Doctors. Even though a 4th vow of slavery to Our Lady is taken there is no clear sign of extra devotion to Our Lady. Daily rosary is on the schedule in the USA, but in Italy it's left up to the seminarian's discretion and prior to making the total act of consecration to Our Lady there is no structured preparation. Though the Institute claims to be orthodox it is frowned on for anyone to receive Holy Communion keeling or for anyone to wear a roman collar. And if you entered you'd find many more examples where prayer and spiritual life take a back-seat to the arbitrary practices at the Institute. We don't write this to question the spiritual devotion of the Institute's current seminarians or priests. We write this so you can be sufficiently forewarned and informed where they were not. If you already have a solid foundation for your spiritual and prayer life and are hoping for it to grow then you may be best served looking elsewhere.